How Clean is Your Dried Fish ??? Doesn’t the dried fish just look so wonderful and harmless it’s wrapped in clear plastic bags? The variety of dried fishes and squids on offer was impressive, and despite the doggie visual we continued with our purchases. Thick meaty pieces of fish are great in soups and stews. What about the greenish-blueish moldy roquefort or stilton? Or a newly-opened over-ripe durian? Aren’t they stinking mad and yet taste heavenly? 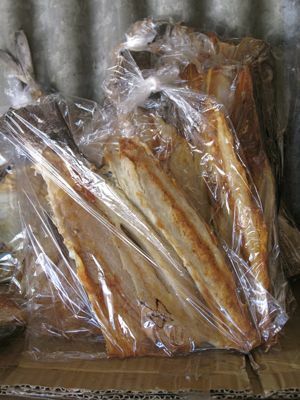 At the least, the dried fish go through some heating process which hopefully kills unwanted bacteria, the moldy cheeses, we eat as is. I love dried fish except for tuyo, I can’t stand it when these are fried. Now I know the reason why these darnedly delicious daings have a lot of character. organic dirt like these is still better than the balsamo (that chemical thing they use to ambalm dead bodies) that i saw being sprayed in some dried fish in Pangasinan. I remember back in the 80’s up to the early 90’s, a significant length of the National Highway in Bataan is used to dry dilis on sticks and I guess other fish as well…and we love those dilis on sticks! And the pungent smell is one indicator we were getting near my grandma’s house! But the poor doggie looks so scrawny and malnourished….famine in the midst of plenty. 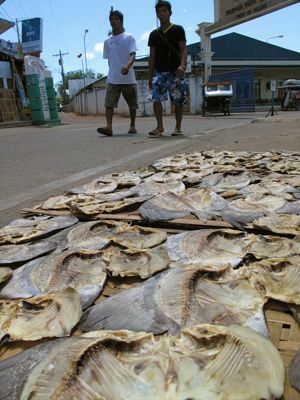 I had not seen prized fish such as lapulapu and mullet as daing before Palawan. 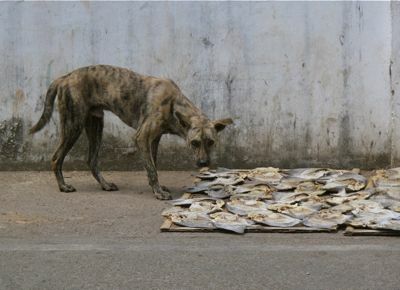 In many coastal areas where catch is plentiful and refrigeration is not available, the fish are dried and taken to market. So yummy with garlic fried rice. UMmm, I can smell it from here	. Remember, it is the scent of controlled putrefaction that we seek in highly esteemed delicacies such as cheese and charcuitrie. Part of the reason too why the traditional treatment for pheasant was to hang it for a couple of days to allow it to loosen out, faisander as the French, ever the connoisseurs of perfume, call it. What about the aging of beef or of Spanish ham? It is to this constant acquaintance too with a truly wide range of culinary smells that Luca Turin (Emperor of Scent) attributes the Frenchâ€™s edge and renown in perfumery. I agreed with you, the hot oil will kill all the cooties from the dried fish coupled with sukaang maanghang (or I hope it would). Love them for breakfast, with sinangag + fried eggs. …always one of the “must-bring-back” after vacation..the doggie keeps its scrawny ‘physique’ since he doesn’t eat its daing with a pile of hot rice..
Eh, I agree with cusinera. Our bodies are pretty resilient. I remember my ecology professor telling me that on average we consume over 2 pounds of insect parts in our breakfast cereal, over a lifetime. There’s all kinds of stuff it’s just better to not visualize where food is concerned. eau de daing –> funny! My sister and her husband who went to the US on their mid-20’s now cannot tolerate tap water in the Philippines. After staying there for more than 10 years they have lost their resiliency to some common waterborne bacterias. They even don’t want ice cubes on their softdrinks here because they can still sometimes experience tummy pain. So only bottled water for them when they visit Manila. I do agree with cusinera. We need to develop our own antibodies by exposing ourselves to some cooties too. lami man ang buad.,,, sir merun ba murag greenhills sa cebu? I cannot in a million years attempt to do just what the Teen did. hehe. such a brave one! Whenever we buy dried fish in the Cebu market, I always make it a point not to do it on the day of departure. Unless we wanted the entire plane to smell like daing. @Rowie. 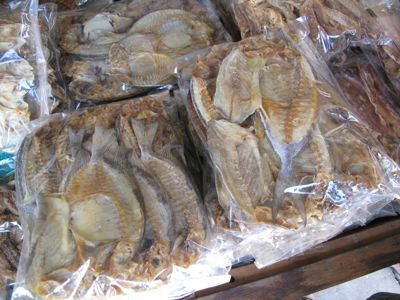 What is the difference between dried fish and tuyo? Ngeee,alright. I think those are the kind of dried fish I prefer, too. I suppose the dried fish from Cebu are done the same way. But, I will still have my dried fish whenever I can. Fried longer, now I see where/how they dry them ;). It has been reported that very very clean environments while growing up is associated with increased allergies and asthma (also a form of hypersensitivity). When I was in the USA I was careful not to cook tuyo during the winter months because the smell travels through air ducts and heating systems of apartment building and it is not fair to the other building occupants a sone cannot readily open doors and windows to air out. To prevent the aroma from wafting through the ducts and crevices, my sister wraps the danggit or dried pusit in aluminum foil then applies heat from a flat iron (clothes not hair). your buying at the wrong place. pagadian and zamboanga have better drying area…atleast far from all the cars and side walks. i once bought several kilos of extremely nice-looking lapu-lapu bulad in iloilo, but when i got home, i was horrified to see many fat maggots. i had to throw the whole caboodle away, but a friend later told me i shouldn’t have done that since all bulad have maggots, anyway. good thing i’m i not an avid fan of bulad. scarier than maggots, i think, would be the formalin in which some fish are soaked before being dried, supposedly to keep the flesh firm. that’s a common practice, apparently. Naku MM I have the same theory about street food: despite the questionale preparation, it tastes diffrent when you cook it at home. Nevertheless, I still wouldn’t say no to dried fish, or street food for that matter. I don’t know about the dog, but I know that old fashion drying of newly harvested palay is done on the side road; kaya nga as a child, we put the rice (that we’re about to cook) in a bilao, and its our chores to take out the mini-stones. With these “tuyo” process, eh bakit ang bagoong, ganuon din naman di-ba? And yet, we love them. I rather they are “fresh-fish” salted and dried completely, than “bugnoy”fish, na hindi naasinan ng husto, tapos hindi napatuyo completely, tapos ayun ibinalot agad sa plastic. At the store, I see it sometimes na medio may “mold”. Even those that are exported here in U.S., somehow, naka-lampas sa check-out ng mga exported products. I don’t remember you mentioning the Maquinit saltwater hotspring in Coron. Have you been there? After all the traveling we did (going to Calauit and back), soaking in the very warm water was a treat. This made me LOL! We always have ‘bulad’ at home and my mom used to say ‘if you only knew where and how these were dried…’ hahaha…so that’s what deep-frying is for. Great with a side of fresh tomatoes and vinegar! When I was young whenever my mother prepare our daily meals, I acquired the basic knowledge of cooking by helping her in the kitchen. One thing I learned from her is to wash the dried fish through running water to lessen the saltiness and to get rid of the unwanted elements from its drying process before frying it. 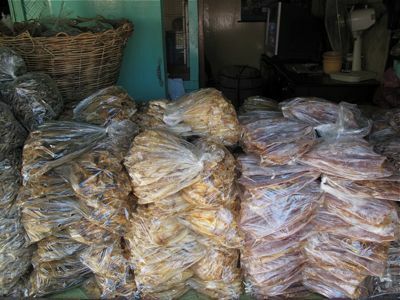 Daing and other salted fish products is considered one of comfort food of us pinoys worlwide. Well, due to the restriction of salt intake we don’t eat it now as much as we used to. The best dried fish in the world to a Goan or Mumbaite is dried Bombay Duck. I am sure Filipinos who have tried this stuffed with Rechado Masala will be waiting to get their next hit. My dream is to open a Goan Restaurant somewhere in Metro Manila in the next two/three years. Till then I will just enjoy MM’s Blog. MM…Have you come across this fish in the Philippines ??? rice is also dried this way. i used to wash rice only once but a few years ago i saw a dog pee, as in urinate on bigas being dried on the road! my jaw dropped. i now wash rice at least twice. hahaha! egad! I remembered your old post about dried fish with maggots. Good thing I don’t like dried fish. Although I think extensive exposure to sunlight and all that salt would’ve killed the cooties. You did !!!! That’s wonderful….I love fresh Bombay Duck Curry with Fresh Cilantro leaves, green chillies, garlic and ginger and cumin all ground to a fine paste. I also love fresh Bombay Duck coated with Semolina and shallow fried. But my best Pulutan is Dried Bombay Duck fried to a crisp inside a bed of Charcoal embers and drizzled with Coconut Oil. I guess its a favourite of the Tsinoys too. 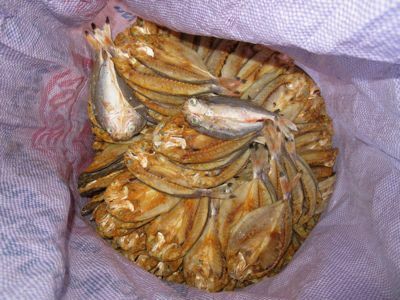 Hello everyone, I am looking to buy dried fish and have it sent to the US, do you know anyone who can sell me some? I would like it without bones, cut in strips, skin is ok, little or no salt if possible. You can text me on 14804528189 or email smartaffair@yahoo.com with subject line saying ‘Dried Fish”. Thank you! Here in Bataan, Most especially in unique Barangay of Pto. RIvas, Balanga,the fish were dried 1 meter above ground using layers of bamboo. 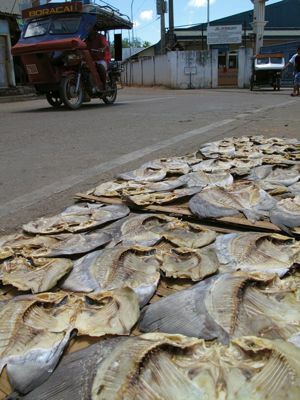 It is directly sundried right beside the seashore where this fresh fish were salted and laid just in a couple of hours. It is 1 day dried and then ready for shipment. We assure that our products were clean.. free from cooties, doggies and catties! Food preparation really matters… That is why we value the health of our customers. At least they got sick because of overeating not because of cooties infection.